Do you have an email marketing strategy in place for your small business? 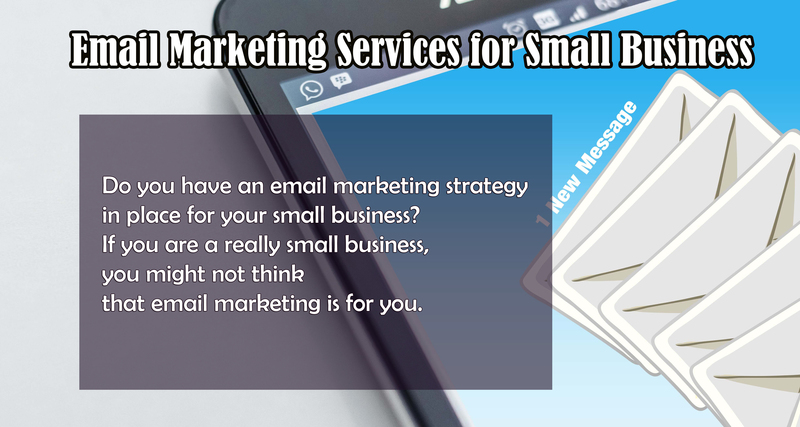 If you are a really small business, you might not think that email marketing is for you. Truth is that all email marketing is for you. Email marketing has been and will continue to be an effective means of marketing to potential clients and current clients. More than 3.7 million people worldwide use email and we are willing to bet that some of those people are in your target audience. If you think that email marketing is a thing of the past, think again. If you look back over the past year, it isn’t unlikely that you’ve been in your email, saw a note from a list you’d subscribed to and clicked through to make a purchase of a product you’d forgot in your cart. Email marketing is sophisticated these days and that means that you have to use the best email marketing services for small business to help you stay afloat when you are working toward your goal or email marketing mastery. With all of the options that you have for email marketing services, how do you know which ones are the best? Which ones are going to allow you to get the best results? There are a lot of great options out there and we are going to go over 5 with you today. One of the largest and fastest growing email service providers online, Constant Contact is one of the easiest to use and most beginner friendly services around. Whether you need to manage your list, contacts, templates or any other aspects of your email marketing, this service keeps it simple. When you get started, your account gets access to tracking and reporting that you can actually understand. You also get built-in social media sharing tools and you can store up to 1GB in the image library. You can contact their support team through live chat or email and you can go through the wide library of resources. If you want more hands-on training, you can get together in your local area for a live seminar or get on a live webinar which is invaluable to the small business owner. If you want to get Constant Contact for your small business, there is a 60-day free trial without credit card requirement and then your pricing is $20 per month. GetResponse is another beginner friendly option. You can even get a training course through them for free that will walk you through email marketing and how to get the best out of your campaigns. There are various automation tools as well as easy ways to manage your lists and perform tasks like list hygiene. If you want to segment your list and market to different people with different messages, you are able to do this through GetResponse. You can use the drag and drop email builder to put together beautifully done emails and craft campaigns that will get attention. You can do a 30-day free trial with GetResponse and after that pricing starts at $15 per month. AWeber has a nice chunk of the market and provides great service to both small and medium sized business so if you are looking to grow, AWeber is set up to be able to help you through each stage. You can easily get started with AWeber if you have WordPress since it integrates seamlessly to give you email templates, list management, autoresponders and email tracking. You will have access to detailed insights so that you can see how your campaigns are doing. You can get support whatever way works for you. Live chat, phone, email and webinars. If you want to learn more about how to operate the platform, there are plenty of how-TOS and tutorials for learning anything that you need to know. A 30-day free trial is available with AWeber and after that you can get started at just $19 per month. Drip has a lot under the hood and is a great choice for eCommerce, marketers and bloggers. You have access to a large variety of tools as well as their smart email marketing platform and if you need beginner friendly this is the way to go. You can use their integration addons for many of the popular website builders like WordPress. This means ease of use for setting up forms and capturing more leads. The reason many people go to Drip is because of the intelligent marketing automation tools as well as smarter email segmenting. If you need a ESP that is highly technical, this is a good pick for you. You can get support through webinars, live chat, detailed courses and free guides with Drip. You can have a free account for up to 100 subscribers and after that plans start from $41 per month. You’ll notice that a lot of bloggers use ConvertKit. It is a powerful email marketing provider that has a suite of features that marketers, authors and bloggers love. You can offer content upgrades easily as well as incentives using email signup forms. You can use the easy to manage auto-responders to drip emails to your list. Segmenting contacts is easy with ConvertKit and you’ll be able to market to the people that are interested and current customers. This makes marketing automation easy. You can get email-based support and there is an extensive knowledge base with high quality learning material. ConvertKit plants start out at $29 per month and there is a 30-day refund policy. These 5 services are among the most popular among bloggers and marketers alike, and offer options that allow you to scale your campaign as it grows. If you’ve used any of these email marketing services? What were some of the benefits? What were the drawbacks? Leave us a comment and share your experience in the section below. Do Startups Really Change The World? What Are the Roles of SEO?